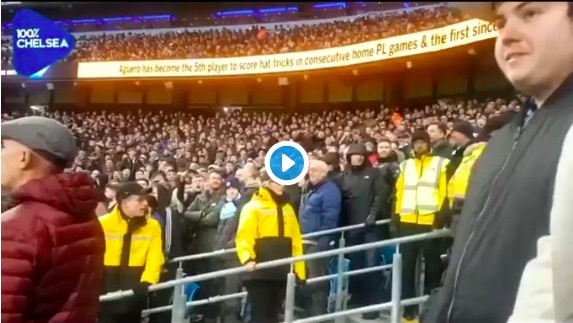 Your team is 5-0 down to Manchester City (NOT LIVERPOOL…) and making fools of themselves in front of the watching millions…. Better sing a song about Steven Gerrard, right, with a massive smile on your face?! In fairness, the people around him give him the kind of disdainful looks we hope would be directed at anybody at Anfield doing the same thing. But Liverpool fans sing about our own team. Our own players. It’s fun… Honest. Chelsea and Manchester City have won seven Premier League titles combined. We haven’t won the title in 30 years. So why are they singing about us? It’s weird. But when you’re 5-0 down, it’s worse! Chelsea fans singing about Steven Gerrard slipping at the Etihad while they were 5-0 down.